When a little girl finds an adorable robot in the woods, she presses a button and accidentally activates him for the first time. Now, she finally has a friend. But the big, bad robots are coming to collect the little guy for nefarious purposes, and it’s all up to a five-year-old armed only with a wrench and a fierce loyalty to her mechanical friend to save the day! 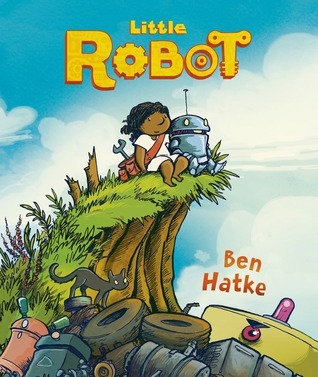 Ben Hatke, author and illustrator of the incredible Zita the Spacegirl graphic novel series, brings readers to another wonderfully crafted world with another fearless and capable young female protagonist. Hatke’s illustrations are, as ever, just sublime: appealing, fluid yet precise, with such a particular vitality about them, I feel like I will always recognize an illustration being his work when I see it. Like Jon Klassen, Dan Santat, Shaun Tan, Julie Morstad, Suzy Lee, or other author/illustrators whose work I find utterly idiosyncratic, Hatke is also carving out quite a niche for his work. While I must confess to not feeling as emotionally attached to this story as I did with Zita’s journey, part of this could be due to Zita’s story and character having more time to develop over the course of three novels. That being said, though, Hatke continues to impress tremendously with his graceful storytelling abilities. Though the various elements to the story in Little Robot flow naturally (and swiftly), there still manages to be a great depth of character sentiments conveyed with little to no dialogue, robot noises, and inanimate objects’ expressions. My one small query with Little Robot (and what kept me from giving this the highest rating) is that I found some issue in why our little robot needed rescuing in the first place. I can’t give away too much here, but I will say that I felt that the creation of the line between the good machines versus bad/evil machines is a little hazy. Fans of Hatke’s previous works will undoubtedly adore his new work here in Little Robot. Readers- both young and old- who are graphic novel fans, or those who enjoy reading titles along the lines of Jellaby, The Silver Six, Bird & Squirrel, Mal & Chad, Cleopatra in Space, Sidekicks, Cardboard, or Binky the Spacecat might especially relish Little Robot. I received a copy of this book courtesy of Raincoast Books in exchange for an honest review.